Dimensions (HxWxD): 1.45" x 2" x 0.55"
This stunning and very unusual formation of Rutile on Hematite is from Minas Gerais in Brazil. 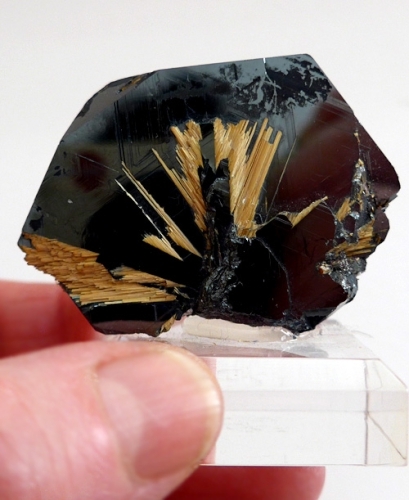 It's a very unusual formation of Rutile in Hematite, a fan shaped Hematite wedge with magnificent bright Golden Rutile fanning outward from a central point in the base. 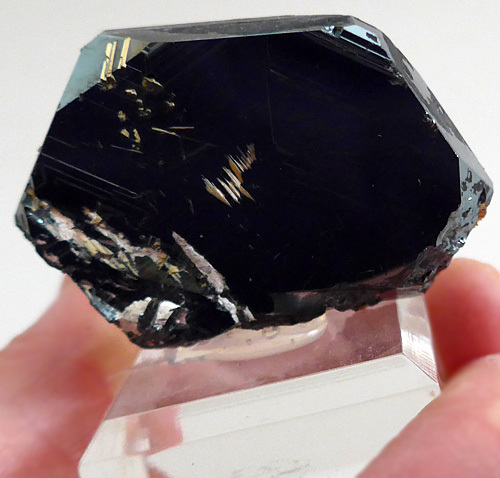 The hematite shines in its deep black reflective glory as the golden rutile sparks a flame within. 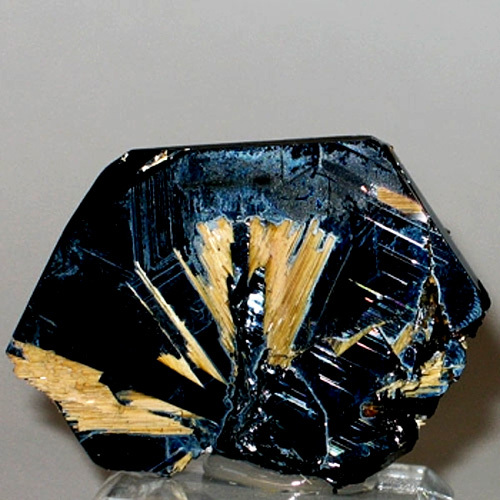 This piece is both a mineralogical collector's item and a subtle energy power tool, suitable for display on your altar, computer workstation, desk, or bedside table. Rutilated quartz is an ideal energizer of people, other crystals and plants of all kinds. In our experience, rutilated quartz has a VERY strong, very "electrical" and affects physical, etheric and astral bodies. By strengthening the mind and promoting active awareness this rutilated clear quartz crystal can help to enhance concentration and mental focus and help you to increase the depth and duration of your meditation sessions and the strength of your connection to inner spiritual guidance and spiritual teachers. Rutilated quartz wands, in my experience, when used in crystal healing, Reiki, or meditation sessions, act as a stimulant to the nervous system and the etheric body. 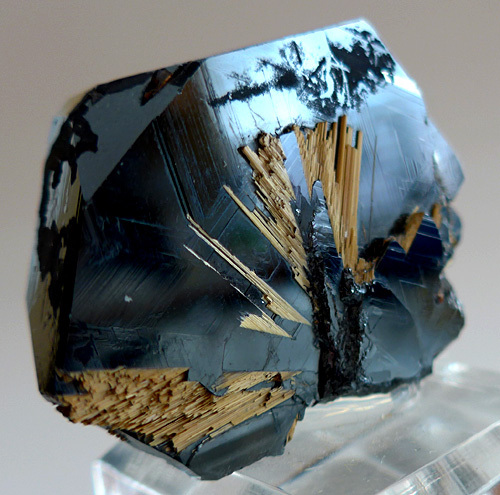 Hematite is a crystalline form of iron oxide with a metallic pearly luster, often occurring naturally in hexagonal or rhombohedral formations in igneous rock strata. Hematite is a root chakra stone, which activates and energizes the energy center located at the perineum, situated at the intersection of the physical and etheric bodies. The root chakra is connected to survival issues, feelings of safety and well-being, and self-worth. The root chakra is the grounded energy of Grandmother Earth that infuses us with the will to live, the desire to love, and the drive to achieve our material and spiritual goals. Hematite helps to ground and center the bearer, and can stimulate feelings of safety and well-being. Hematite is considered very beneficial for spiritual practitioners and meditators who wish to maintain a balance between Heaven and Earth, to remain grounded while experiencing higher, altered states of consciousness and spiritual awareness. You can read more about crystals in our article "Using Quartz Crystals in Digital Technology, Healing and Meditation"or you can read about Marcel Vogel and crystal healing in that article. Read more about rutilated quartz and other types of quartz crystal at the SatyaCenter.com crystals homepage. Note: Weight above is shipping weight. Actual Weight is 70 gm.